Peel the eggplant and cut into lengthwise slices 3/8 in thick, about 3 inches long, and 1 inch wide. Scrub the zucchini, slice off the two ends, and cut into slices about the same size as the eggplant. Place the vegetables in a bowl and toss with 1 teaspoon salt. Let stand for 30 minutes. Drain. Dry each slice in a towel. One layer at a time, sauté the eggplant, and then the zucchini in hot olive oil for about a minute on each side to brown very lightly. Remove to a side dish. In the same skillet, cook the onions and peppers slowly in olive oil for about 10 minutes, or until tender but not browned. Stir in the garlic and season to taste. Slice the tomato pulp into 3/8-inch strips. Lay them over the onions and peppers. Season with salt and pepper. Cover the skillet and cook over low heat for 5 minutes, or until the tomatoes have begun to render their juice. Uncover, baste the tomatoes with the juices, raise heat and boil for several minutes, until juice has almost entirely evaporated. Cover the casserole and simmer over low heat for 10 minutes. Uncover, tip casserole and baste with the rendered juices. Correct seasoning, if necessary. Raise heat slightly and cook uncovered fro about 15 more, basting several times, until juices have evaporated leaving a spoonful or two of flavored olive oil. Be careful of your heat; do not let the vegetables scorch in the bottom of the casserole. Set aside uncovered. Reheat slowly at serving time, or serve cold. this sounds really great I'm definatley going to try this - many thanks. 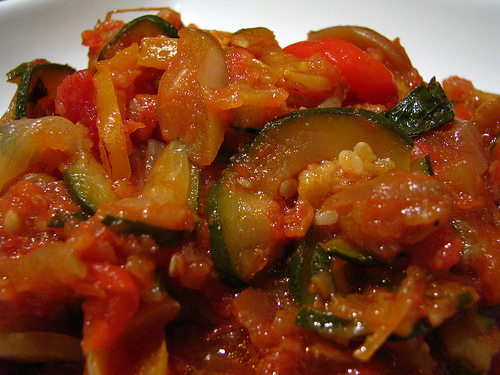 This is a classic ratatouille recipe from Julia Child's Mastering the Art of French Cooking.